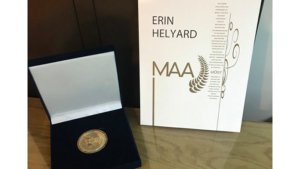 Nominated by a panel of industry peers, a MOST Achievement Award (MAA) has been awarded to Erin Helyard in recognition of his exceptional contribution to the Arts in Australia as a conductor, performer, and artistic director. The MAA was presented to Erin by Jeffrey Black, Chair of the ASC Music Advisory Committee. I am extremely honoured to have been named the 2018 recipient of the MOST Achievement Award and humbled indeed to be following in the footsteps of colleagues whose work I so deeply admire. Ever since I can remember, I have been fascinated by the extraordinary power of the human voice. Because it has a text, the illocutionary force of the vocalist surpasses that of the instrumentalist. Singers tell stories and sing poetry. In the 1960s theorist Roland Barthes famously spoke of the “grain of the voice” and the strange combination of factors that move us to heightened emotional states. Somehow combinations of phenomena affect us all in differing ways: it might be the persona of the singer, the register of the voice, or the setting of the text—we are affected by whether the voice is tugging at the extremes of its register or it is comfortable and relaxed, and we are mesmerised by the unique transformation that undergoes the singer in the act of singing. All my musical life has been dedicated to the power of the human voice. I emulate the voice at the keyboard, as all treatises of the past exhort us to do, and they move me as I conduct or accompany them in operatic performances or lieder. I am honoured to be at the helm of an opera company dedicated to the performance of great operas of the past and I am constantly inspired by the wealth of talent that surrounds us in Australia and for which I have made it my mission to support and celebrate. I congratulate all the finalists at tonight’s concert and pay tribute to those who have supported them in their journey. My warmest thanks for this great honour! Thank you! Erin Helyard has been acclaimed as an inspiring conductor, a virtuosic and expressive performer of the harpsichord and fortepiano, and as a lucid scholar who is passionate about promoting discourse between musicology and performance. Erin graduated in harpsichord performance from the Sydney Conservatorium of Music with first-class honours and the University Medal. He completed his Masters in fortepiano performance and a PhD in musicology with Tom Beghin at the Schulich School of Music, McGill University, Montreal. He was named the Westfield Concert Scholar (Cornell University) on fortepiano for 2009-2010 and from 2003 to 2012 Erin was a central member of the award-winning Ensemble Caprice (Montreal). As Artistic Director and co-founder of the celebrated Pinchgut Opera and the Orchestra of the Antipodes (Sydney) he has forged new standards of excellence in historically-informed performance in Australia. He has conducted from the keyboard performances of Purcell’s Fairy Queen (Montreal Baroque Festival), Cavalli’s L’Ormindo, Purcell’s Dioclesian, Vivaldi’s Griselda, Cavalli’s Giasone, Salieri’s The Chimney Sweep, Vivaldi’s Bajazet, Grétry’s L’amant jaloux, Handel’s Theodora, Rameau’s Pigmalion and Anacréon, Monteverdi’s Coronation of Poppea, Handel’s Athalia (Pinchgut), Handel’s Acis and Galatea (NZ Opera), Handel’s Orlando (Hobart Baroque), Purcell’s Dido and Aeneas, and Handel’s Faramondo and Agrippina (Brisbane Baroque). Operas under his direction have been awarded Best Opera at the Helpmann Awards for three consecutive years (2015-2017) and in 2017 he was awarded a Helpmann for Best Music Direction for Handel’s Saul at the Adelaide Festival in a fêted revival of a Glyndebourne production directed by Barrie Kosky. As a conductor Erin has distinguished himself in dynamic performances with the Adelaide, Tasmanian, and Queensland Symphony Orchestras and the Australian Haydn Ensemble. Helyard duets in nineteenth-century repertoire on historical pianos with renowned Alkan exponent Stephanie McCallum and on fortepiano and harpsichord he has recently been described as “Australia’s most engaging soloist” by Limelight magazine. In 2017 Helyard was awarded a major Australian Research Council Discovery Grant for a collaborative project entitled Performing Transdisciplinarity: Image, Music, and Text in Eighteenth-Century Print Culture. He is currently Senior Lecturer at the Melbourne Conservatorium of Music and appears by kind courtesy of that institution.